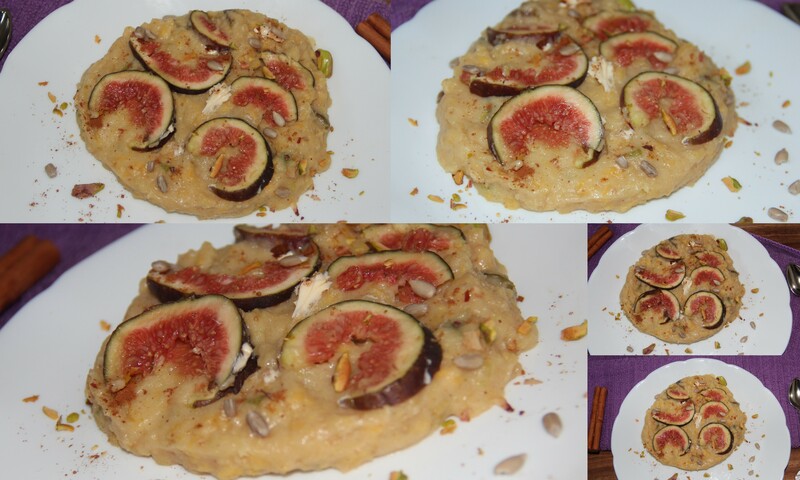 Cinnamon spiced cornmeal porridge with fresh figs is perfect for the cold wintery days and the colours remind me of the autumn months. I love porridge, even living in the hot summer dessert, I still crave a delicious comforting porridge which gives me a warm and fuzzy feeling inside. This dish is inspired by Kesari bath, an Indian sweet breakfast. Cornmeal is ground dried corn, which is added to certain recipes like bread and pancakes. It can also be cooked to make polenta or grits. It’s also a good alternative to flour for people who have a gluten sensitivity or celiac disease. The food supplies a wealth of certain nutrients, too. Cornmeal has a good carbohydrate. These types of whole grains contain complex carbs, fiber and other nutrients, and they can help prevent diseases like diabetes, heart disease and some cancers. Add cornmeal to a bowl and pour in 1/2cup water and let it soak for 5 minutes. While the cornmeal is soaking, add the remaining 1 1/2cup water to a saucepan along with milk, cover and bring it to boil. Pour in soaked cornmeal along with water in the bowl, lower the heat and let it simmer and keep whisking to avoid lumps. Let it simmer for 10-12minutes, once the cornmeal is cooked, turn off the heat. Stir in ground cinnamon, honey stirring until fully incorporated. Drizzle some Maple syrup over cooked figs and top on porridge and serve. Cornmeal form lumps so preferably soaking helps to avoid lumps. Posted on January 5, 2015, in Breakfast, Breakfast, Dessert, Indian, International, Sweets and tagged Gluten free healthy dessert. Bookmark the permalink. 25 Comments. Beautiful colours of fresh fig slices give a new perspective to this dish! The toppings nearly steals the show! I did not know soaking helps relax cornmeal and reduce lumps…thanks for the tips, Chitra! I love cornmeal porridge. I didn’t know that cornmeal is a good carb, that is very good to know because I love it.sweet or savory it’s delicious. The fresh figs are a wonderful addition as is nuts or seeds. A great start to the day. This does sound comforting, even for an old desert dweller like myself. And cornmeal is a great carb, don’t forget grits. I am enjoying a cup of homemade ginger tea, seasoned with allspice, cinnamon and cayenne pepper. I am now longing for the desert though ,with the Ohio temperature at 16 degrees Fahrenheit. Brrr…. Hi Charu dear, am good… How are you? Missed you tons dear…. Why 2- 3 weeks? Nah. Mum’s bit ill. So am shuttling between Sydney and B’lore. mmmm…what a wonderful breakfast! You have me craving it now, too 🙂 Especially loving the fresh figs.